Check out a newer version of this post! For more recent examples, head over to our latest healthcare website best practices. Not every hospital is the same, however, all hospitals and health care providers should have a professional online presence. First and foremost, an effective medical website should be easy to use and full of information. The organization and presentation of this information must be strategic and intuitive so patients and other visitors can find what they need quickly. In today's health care market, a high quality website is expected by the general public. Below are more details for each 'must have' along with some of our favorite and best health care websites. Search is important for websites with a database or wealth of information because it helps visitors navigate and find what they need quickly. Unless you want your visitor to wander through your pages and try to find what they are looking for, they can simply search for what they need. This is the easiest and fastest way for the viewer to receive information that they are looking for is a search bar. 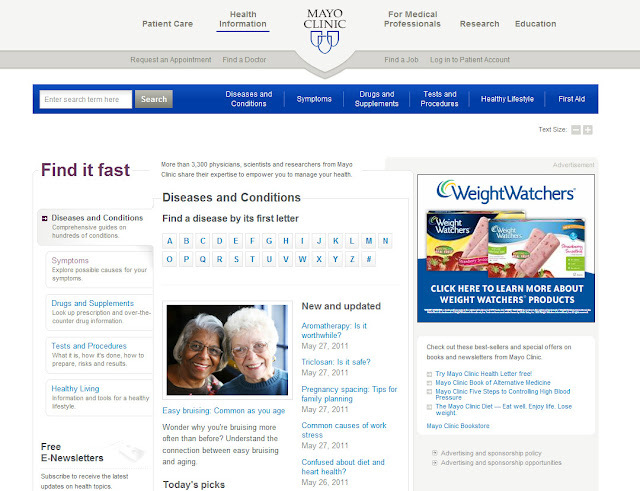 Search bar is traditionally located in the top upper right of the website. For intuitive design purposes, it is a good practice to place common items where the visitors expects them to be. 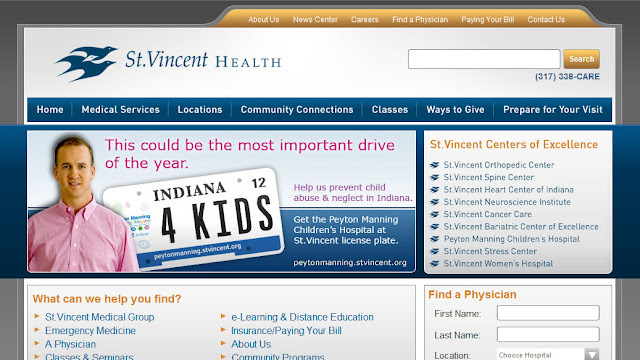 St. Vincent Health does a good job of this. The search is clear and not cluttered by many other element in this layout. TIP: Be sure your website search and results work properly. You would be surprised by how many search results do not yield effective or even correct information. This can require some custom functionality but is extremely important to visitor satisfaction and usability for your website. In addition to search, a site map outlining all pages of the website is a good practice and quick way to give visitors an overview of the website depth. Visitors and new patients want to see a photo of the doctor they will be seeing, they want to see the team, they want to see a list of credentials. A directory of physicians should contain photos, what they specialize in, credentials and specialities, and their contact information. 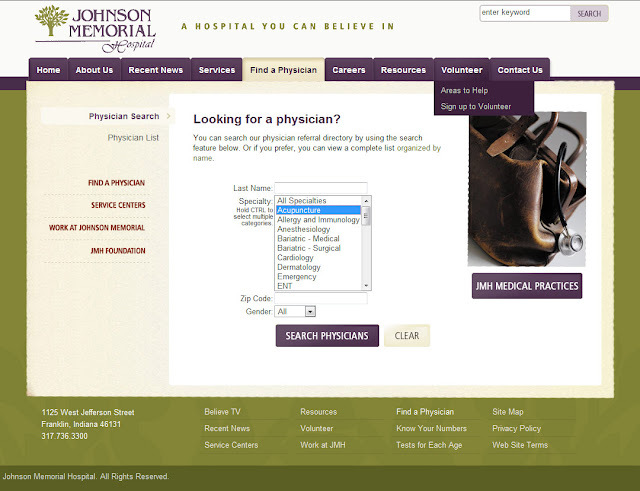 Depending on the size of your practice, coupling the directory with a physician search feature would be very effective (search by name, speciality, location, accepting patients, etc.). Johnson Memorial Hospital has a nice physician search function and corresponding physician details pages. These types of links include "how to find us", "how to become a patient", "how to find your provider", "pay bills", "registration", etc. These links are important to have because they are more than likely the top reasons visitors have come to your website. These links are often separated out somehow in the design and important to be easy, clear, and on many pages of the website. TIP: Designing these links in the utility navigation or a 'big' footer allows them placement on every page. 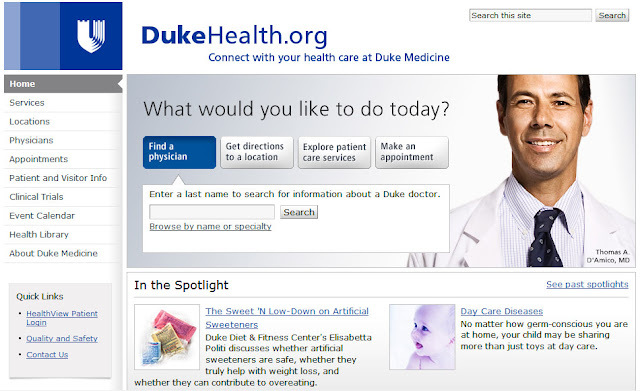 One of my favorite health care websites--it clearly asks the question 'what would you like to do today?' and offers actionable link options. Notice the physician search feature is front and center. but they arrangement and presentation is clear. The design is clean and professional. From one hospital to another, many services are the same; however, every hospital excels in one area or another. They have unique physicians and/or awards to feature around each service, as well as an opportunity to show off their facility. 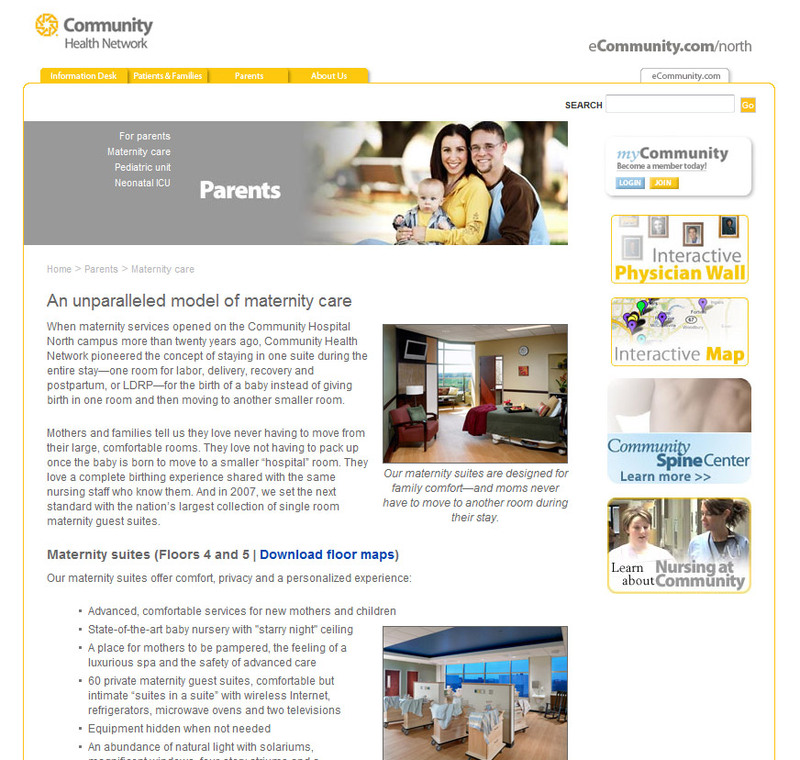 Community North has a fantastic maternity center and they emphasize that. They included verbiage such as "we set the next standard with the nation’s largest collection of single room maternity guest suites", they offer floors map along with many photos. A reputable medical facility or hospital will offer its visitors common health information. Unnecessary visits to the physician can be avoided by providing basic information on their website, as well as answering basic frequently asked questions. 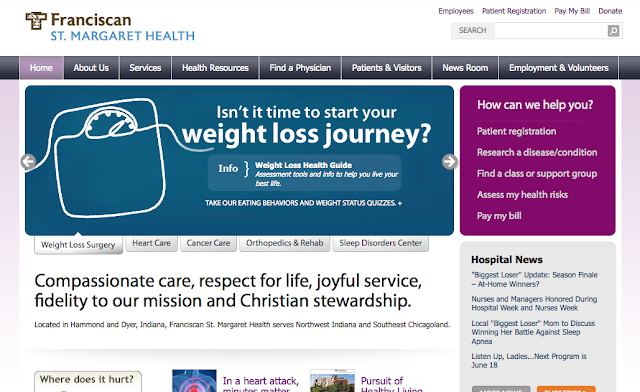 With so many health and medical websites on the Internet, visitors trust their hospital and the information it provides. Patients want their hospital to provide this information to them instead of sifting through the information from other sources. There are third party services that hospitals can use to gather and present the health information, as well as keep it up-to-date without hassle. A couple to mention are A.D.A.M. Health Services and Rueters Health. A professional web company can help make the presentation of information appear seamless in your website. Mayo Clinic has more health information that I have seen on other health care websites. They offer it in a very organized and strategic presentation with many options for the user to find what they need (alpha selection, category filter on left and top, as well as the general search). 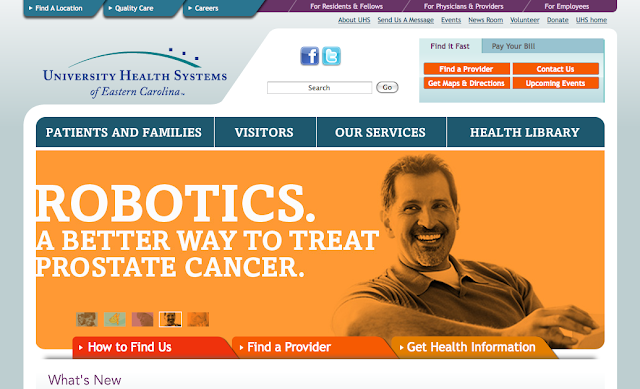 Note: Health Information is one of their primary main categories. 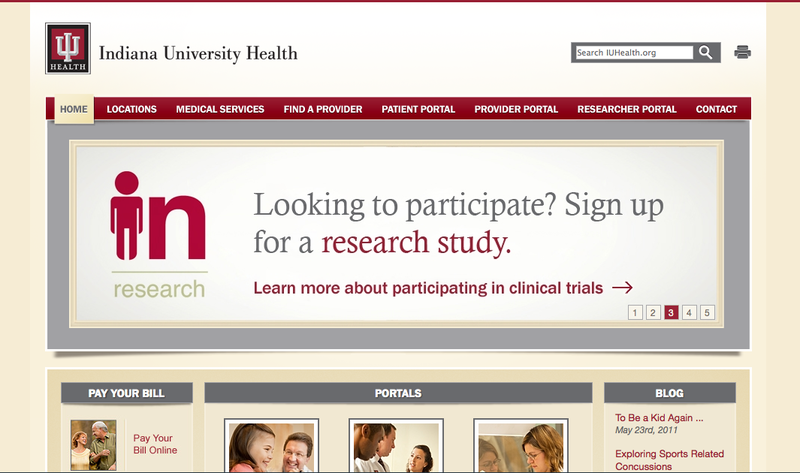 IU Health has it all, a search bar, pay your bill section, and a portal section to take you to specific locations. Their navigation links are also set up simple enough for the user to not get lost. This website has a search bar and a find a doctor button clear and simple at the top of the page. They have a great navigation architecture and they have four helpful sections clearly designed across the bottom. This website starts off strong with a "How can we help you?" section along with rotating screens emphasizing popular services and specialties. They also have a search bar and a functional link for pay my bill in the utility navigation. This website has a lot of the things that we are looking for: a search bar, how to find us, find a provider, get maps and directions, contact us, and pay your bills. Each of these must haves are placed strategically on the page to help them stand out. Strategically, their main navigation is divided and simplified into only four main sections. You can see a few additional examples on blog by Adazing called 10 Best Hospital Website Design. 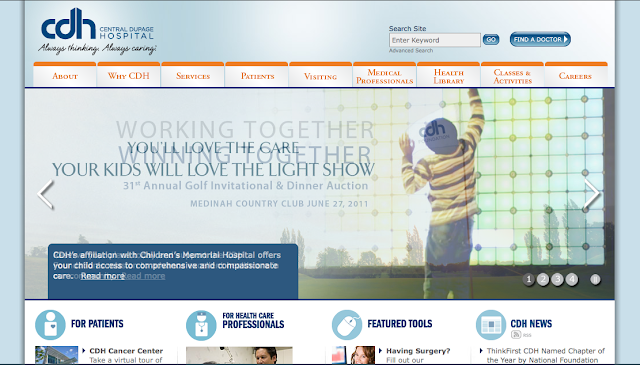 TBH Creative has experience with building effective health care and medical websites. We know what it takes and can help your facility prove results online. Complete our request a proposal form to start your website improvements today.